Consider: More than 6.5 million older adults struggle with depression, but fewer than 10 percent receive treatment. Add that suicide rates among this cohort are up to seven times higher than in other age groups, so finding some relief in any way — whether with antidepressants or talk therapy — could prove life-saving. But there's a problem. Doctors often miss the signs of depression in an older population because the symptoms are different in younger patients. Instead of feeling sad or blue, seniors are apt to feel irritable or tired, have trouble sleeping, lose their appetite and be unable to concentrate, new research published in the Journal of Applied Gerontology finds. In fact, Helen C. Kales, M.D., professor of psychiatry and researcher at the Veterans Affairs Ann Arbor Healthcare System, says research shows that up to 40 percent of older patients with depression — that's 2.6 million people — may have such symptoms. No wonder it's so much harder to diagnose depression in older adults. Depression screening is one of the free services offered under the Welcome to Medicare visit provided through the Affordable Care Act, and mental health experts say it's helping more older patients get treatment. 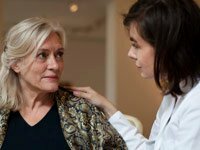 In 2000, research showed that fewer than 25 percent of patients over age 65 with probable depression received a diagnosis and treatment, but by 2007 that had jumped to nearly 52 percent. The increase in screening, says Mayo Clinic psychiatrist William Bobo, M.D., reflects a growing awareness that major depression is a common but treatable disorder in older people. Screening tools in a doctor's office "can give people a way to get the treatments they need to stop suffering." Antidepressant use has skyrocketed — jumping 400 percent between 1988 and 2008, according to the National Center for Health Statistics — but they're far from a sure bet in beating depression. While meds can be effective, "the belief that medications will solve the problem is too simple. Depressed patients who take medication and do nothing else are not very likely to have a full, lasting recovery," says psychologist Stephen Ilardi, Ph.D., associate professor of clinical psychology at the University of Kansas and author of The Depression Cure. The other depressing news about antidepressants is that research shows they often don't perform any better than a placebo. And there's been little progress in developing new drugs. In 2010, GlaxoSmithKline, the pharma giant that makes antidepressants such as Paxil, stopped researching new drugs for depression. To complicate matters, older adults are at higher risk for side effects from antidepressants, such as increased danger of falling and loss of bone density, as well as drug interactions with their other meds. And Bobo cites another reason that finding the right medication may become trickier with age: Age changes a patient's ability to metabolize medication, and that increases susceptibility to side effects. Mixed results with antidepressants have led researchers to explore other treatments for depression, including electromagnetic pulses to stimulate the brain. Probably the simplest, healthiest and most effective treatment for depression in older adults is exercise, according to a 2013 study in the British Journal of Psychiatry. Going for a brisk walk every day, hitting the driving range or signing up for a dance class can be a natural mood elevator. Literally. Depression has a number of physical symptoms such as low energy level and appetite suppression. These signs can also indicate serious medical problems such as heart disease, according to Bobo. "It's not just a psychological experience," he says. "Often, the physical symptoms are the ones that come to medical attention first even before feelings of morbid sadness." Research published in the journal Health and Quality of Life Outcomes found that half of women diagnosed with depression also experienced physical pain; the more severe the pain, the more severe their depression. To complicate matters, depression can be difficult to diagnose in people who experience physical, not emotional, symptoms. If depression is left untreated — which can happen if doctors are working to identify the cause of the aches and pains and not asking about possible emotional issues — Bobo warns, "It can worsen treatment outcomes and make recovery more difficult to achieve." Women are diagnosed with depression twice as often as men, possibly because they're more at risk because of hormonal changes, including menopause. However, testosterone may also play a role in men's depression. According to research published in the journal Drugs and Aging, the age-related decline in testosterone levels could lead to an increase in depressive symptoms in men. But there may be some potential good news: In 2011, researchers at Florida State University conducted four studies in which male rats were injected with testosterone. The hormone had the same effect as antidepressant medications, reversing the impact of depressive symptoms. Depression was linked to a more than twofold increase in stroke risk for women between the ages of 47 and 52, according to a study published in Stroke, the journal of the American Heart Association. "It's unclear why depression is so strongly linked to stroke … but it is thought that the body's inflammatory processes and their effects on blood vessels may play a part," says Caroline A. Jackson, Ph.D., researcher and epidemiologist in the School of Population Health at the University of Queensland. It's part of a growing body of research linking mental health to physical health, says Jackson. She encourages older adults with depression to seek medical help and maintain or adopt a healthy lifestyle to minimize their stroke risk. In white adults over 65, the rate of male suicides is more than five times greater than female suicides. While suicide rates for women decline after age 60, for men, the odds of taking their own life increase with age. Men over 85 had a suicide rate more than twice that of their younger counterparts. Part of the problem may be that no one realizes they're so severely depressed. One of the leading causes of suicide in older adults is undiagnosed or untreated depression, according to the American Association of Suicidology. "[O]lder depressed adults often have not received the help that they needed," says Kales. "They may be living alone and their health may be more fragile. This may contribute to higher suicide completion rates." Depression is an illness characterized by feelings of hopelessness, but Kales is quick to point out the good news: "Depression in older adults is generally highly treatable," she says. In fact, a study published in the Harvard Review of Psychiatry found a 48 percent reduction in symptom severity among people over age 55 who received antidepressant medications as treatment for depression. Research also found that 72 percent of patients over age 65 who participated in cognitive behavioral therapy sessions found it useful. "A combination of medication and psychotherapy is highly effective for helping patients feel better," Kales says. Jodi Helmer is a freelancer writer.